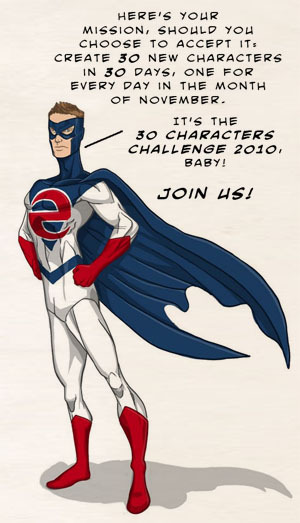 The 30 Characters Challenge is Back! The Challenge: Create 30 new characters in 30 days- one for every day of the month of November. Why: Because the world needs new characters. When: Starting November 1st, 2010. Where: Right here on at 30Characters.com. How to Register: Registration for 2010 is now closed. Stay Connected and Spread the Word: Follow the hashtag #30characters on Twitter for the latest information on the 30 Characters Challenge! Tyler James is a comics creator residing in Newburyport, Massachusetts. I’m in. No art, but plenty of character sketches. I’ll get in on this. Put me up for the challenge. This is the kind of challenge I need right now to get me out of my drawing famine. I’m in, and I’m actually gonna complete it. Designing characters is one of my favorite things to do! I’m in! Sounds fun, I want in. I’d love to participate, sounds like a blast…apologies if this is a double post had a little trouble posting. I’m more likely to pen something than draw it, so stick figures are a definite future possibility. However, this sounds too much fun to resist, so I’m in on the challenge.